Micro-Tek Gel – All the effectiveness of Micro-Tek Spray in a GEL concentrate with an aloe vera base. Anti Fungal Anti Bacterial formula made for use in rain rot, girth itch, sweet itch, ringworm or any skin condition,. Micro Tek Equine Gel stops itching immediately. Protects up to 24 hours. 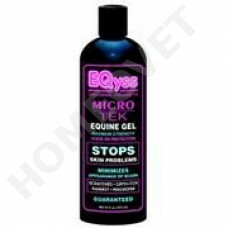 Can be used in combination with the Eqyss Micro Tek Equine shampoo, especially if the problems persist longer. It does not hurt in open wounds and helps to prevent skin problems. Special for treatment of summer eczema, skin irritation, ringworm, itching and mud fever. Micro Tek Equine Gel contains no steroids, alcohol, and is environmentally friendly. For horses that don’t like to get sprayed or for use in the winter when it’s too cold to spray. Provides instant relief which continues to work over a 24 hour period. Soothes irritated skin on contact. Rub the gel on the affected locations and allow the gel to act. Don´t remove, lasts up to 24 hours. Repeat this is until healing once a day.